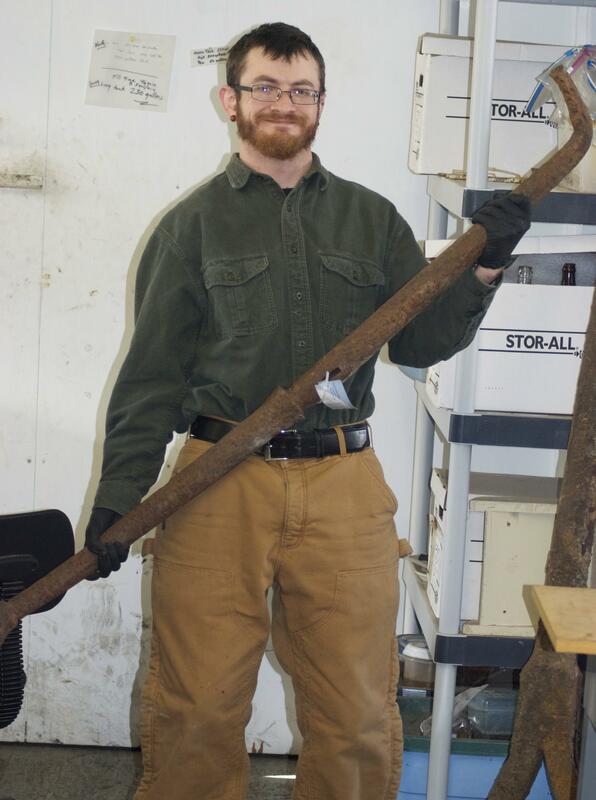 In addition to preserving small artifacts such as grapeshot rounds, nails, and tools, the archaeologists at the Lake Champlain Maritime Museum’s Conservation Lab also work on much larger objects. Anchors, cannons, and mechanical parts constitute this group of cultural resources. While the methodology of conservation remains the same, we are required to adapt our techniques with these “monster” artifacts. This is the norm regardless of whether it is made of iron, glass, wood, or composite materials. A few projects that we are involved with right now include a mid-18th Century swivel gun, a stock-bar from a 19th Century folding anchor, and a curved bracket from an early 20th Century ferry. Since these artifacts are made of iron, they need to go through electrolysis in order to remove any layers of rust that have developed on the surface. Due to the sizes of these artifacts, some measuring in at over five feet long, they require a tank that is large enough to accommodate them. We also have to be aware of adhering to proper ventilation procedures due to the amount of hydrogen produced during the electrolysis process. Electrolysis separates water, or H2o. This is done by generating a small electrical current of 5 volts with a battery charger in a 5% solution of sodium carbonate and water. The negative terminal is connected to the artifact and the positive terminal is connected to a mild steel screen. While the process is working, the oxygen is attracted to the steel screen and the hydrogen is attracted to the artifact. In effect the hydrogen bubbles in between the good metal and rust, thus helping to remove corrosion. Hydrogen is highly flammable and can ignite with just a small spark, especially if it is produced from a large source. When a proper tank has been assembled, we can then place the artifact in and allow electrolysis to work. The use of picks, scrapers, and good old fashioned elbow grease will help to scale back any other rust on the surface of the object. Three coats of tannic acid are applied, which helps to stabilize iron by effectively halting further corrosion. A bath of hot wax is then used where the object is submerged in a microcrystalline wax heated to 300 degrees Fahrenheit. This dehydrates the artifact by forcing any moisture out and coats it in a protective sealed layer of wax. When the dehydration is complete, we ensure that both the pre- and post-documentation work is done. This involves photography, scaled drawing, and detailed notes concerning the conservation process. If the artifact is part of our collection, we label it and store it for future exhibition. If it is a contract job, we package it and ship it back to whomever contracted us. Then, we start setting up for the next artifact.